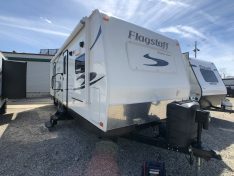 Looking for an RV with a lot of kitchen counter space? Front Kitchen Travel Trailer floor plans provide an extra-large kitchen with ample counter space for all of your food preparation needs. Front kitchen campers will have the master bedroom in the rear of the camper with the bathroom also near the rear of the RV. 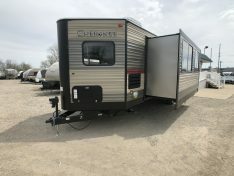 We sell a very unique front kitchen Travel Trailer floor plan. Our “V-Nose RV floor plan” has an aerodynamic front cap which provides for easy towing and better fuel economy.